T8 Ocean Sun® 10,000K | Zoo Med Laboratories, Inc. The Ocean Sun is a 10,000k high intensity lamp which creates a beautiful “deep ocean” effect in your marine or freshwater aquarium. This emission spectrum, strong in the blue regions, supports the photo biological processes of marine algae and freshwater plants. 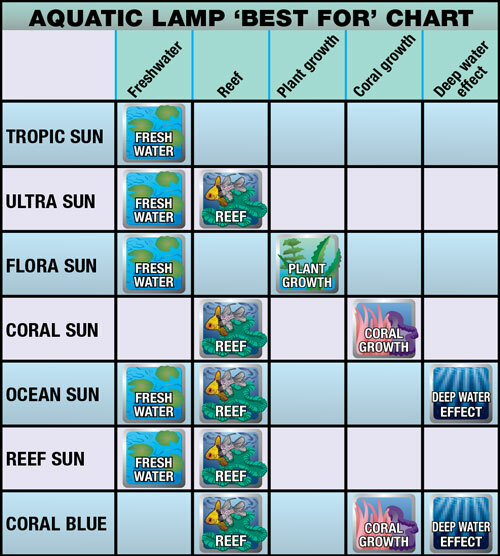 Ocean Sun promotes the growth of zooxanthellae algae, essential for the growth and well being of all photosynthetic corals and invertebrates. Ideal for all marine aquariums, and freshwater aquariums where a deep water effect is desired. Zoo Med’s line of fluorescent aquarium lamps are made in Europe for ultra high quality, color, and longer burn life. Our energy saving T8 sizes can save you up to $30.00 per year in electricity over the thicker T12 size lamps! Effective up to 10,000 hours.